Address: Tourist Complex Area Fatehabad Road, Agra, Uttar Pradesh, 282 001. Facilities: Single A/C 4, Single Total 4, Double A/C 40, Double Total 40, Total A/C Rooms 44, Total Rooms 44, Fully Airconditioned, 3, 150, 30, 1, Indian, Continental, Chinese, Room Service, H/C running water, Telephone, Fax, T.V., Safe Deposit, Banquet Facilities, Conference Facilities, Swimming Pool, Lush Green Gardens . Services: Doctor on call, Laundry, Money Changer, Safe Deposit . The Hotel Atithi is barely a kilometer from Taj Mahal. The Hotel is known for providing personalized service and seems to follow the old tradition of Indian hospitality, which is why it considers its prime duty to serve the "atithi' or the guest as best as it can. It offers well furnished and tastefully done rooms to its guests along with 24 hr room service. The Hotel provides Banquet and Conference facilities for its business travelers and numerous recreational facilities to its guests who are on pleasure trips to Agra. It has a crystal-clear swimming pool and lush green gardens that are a soothing treat for the eyes. It is an ideal hotel for a relaxing stay in the beautiful city of Agra since it provides all the modern comforts along with an inviting ambience that makes one feel right at home. The hotel Atithi Agra has two restaurants that serve Indian, Chinese, and Continental cuisine. The hotel Atithi also has a poolside cafeteria 'Sarover'. 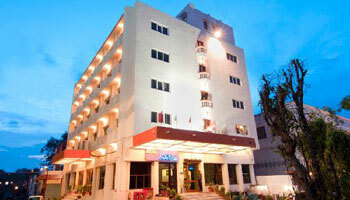 What do you think about Hotel Atithi Agra? The Atithi is a comfortable hotel and seems good value for Agra. The rooms were of good size and clean. Room service was excellent and necessary as there is no bar. The pool is accessed from outside the hotel and the surrounds are not all that clean. At the time of our visit the garden was very wet and was closed. The dining room is uninspiring but served good food with attentive staff. We stayed at the Atithi for 3 nights in June and found the reception staff to be polite, friendly and attentive with good English skills. The rooms were reasonably clean when we arrived but were not cleaned at all during our stay. The air conditioner did not work, and that was during a heat wave of 46 degree temperatures. Nice size hotel, pool surrounded by large buildings all the way around garden. Street quiet enough, fairly residential, but off a busy main road. Lifts okay, INTERNET DID NOT WORK, food basic, although my request for a fruit breakfast brought it out. The room was clean spacious and tidy, without anything to complain about. I was pleased with my 1 night there, seeing the Taj in the afternoon, only 15 mins by car away, through the city, and laughed about being woken at 6am by the Muslim call to prayer on Friday. Avoid Friday at the Taj-it is closed. Friendly local card shop on main road. Boys there are good English speakers and very polite.